Flying officer Avani Chaturvedi created history on Monday when she became the first Indian woman pilot of the Indian Air Force to complete a solo flight in a MiG-21 Bison fighter aircraft. She completed the half-an-hour long solo flight in the Russian-origin jet in the skies over Jamnagar Air Base. “This is a major milestone in training of a fighter pilot and first time an Indian woman has flown a fighter aircraft solo. It demonstrates IAF’s enduring commitment to ‘Nari Shakti’,” IAF spokesperson Wing Commander Anupam Banerjee said. Chaturvedi, who is posted to No. 23 Squadron (Panthers), is from the first batch of three women officers who were commissioned as fighter pilots in the IAF in June 2016. Till last week, she had undertaken flights in twin-seater training jets, accompanied by Qualified Flying Instructors of the IAF. 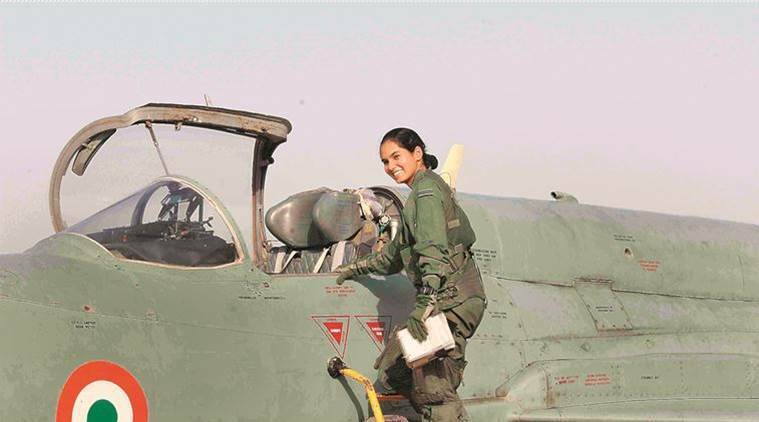 After completing her basic flying training on a Pilatus aircraft at the Air Force Academy, Chaturvedi underwent six months of training on Kiran trainer jets at Hakimpet, which was followed by a year-long training stint on Hawk advanced trainer jets at Bidar Air Base. “Flying Officer Chaturvedi has done well in flying. You will not send someone who is not good to fly a MiG-21,” one of her flying instructors told The Indian Express. Chaturvedi’s colleague, Flying Officer Bhawna Kanth, is expected to follow suit with a solo flight in MiG-21 Bison fighter jets very soon. Kanth is posted at Ambala with No. 3 Squadron of the IAF. Sources in the IAF called this a significant moment as it signifies a breakthrough in providing a “real” combat role for women in defence services. “This shows genuine equality of women in IAF because we have not gone by advise to shield them,” a source said. Chaurvedi and Kanth were selected to be fighter pilots when IAF had agreed to induct women as fighter pilots on “an experimental basis” for an initial period of five years. After the first batch of three, which includes Flying Officer Mohana Singh, the second batch of two women fighter pilots is undergoing training at Bidar on Hawk advanced jet trainers.